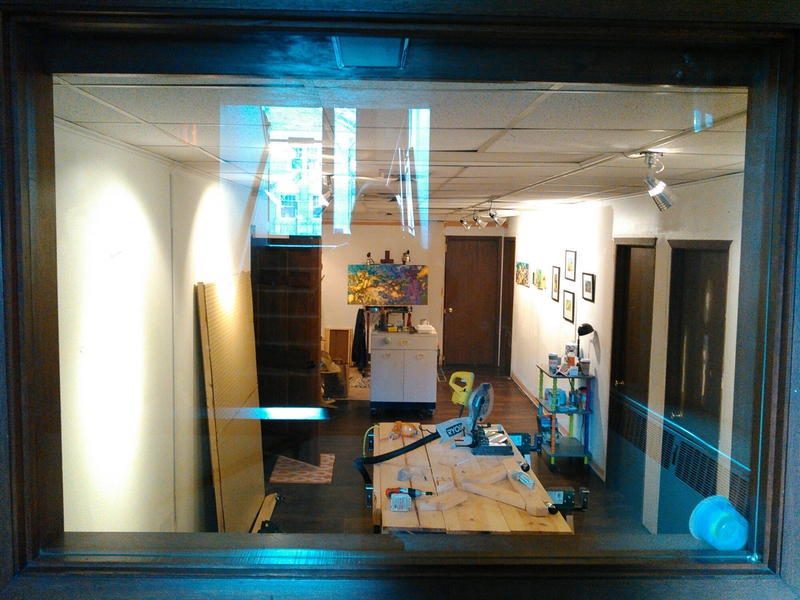 There is a window that looks directly into the studio, which is in the lower level. 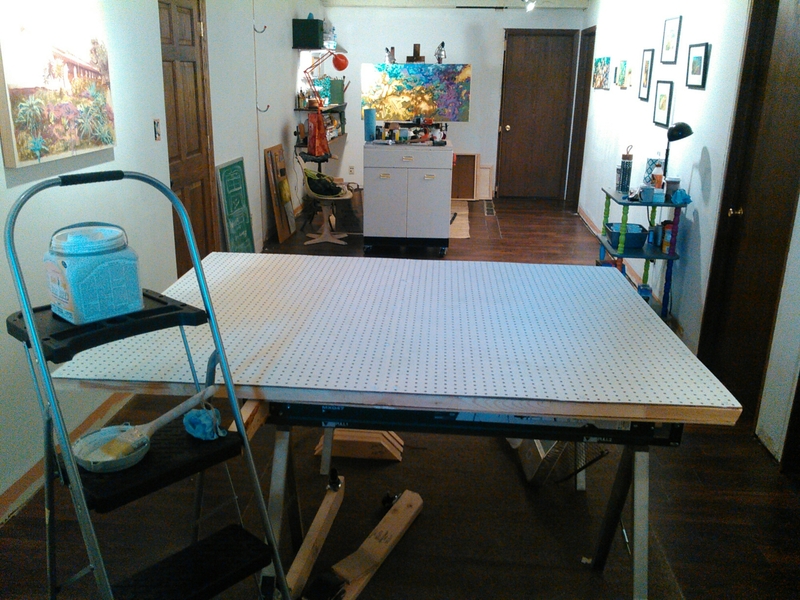 It is perfect, because you can see straight into my studio from the sidewalk. In the reflection on the glass, you can see the entrance to the building and maybe some steps and a railing behind the silhouette of my head. 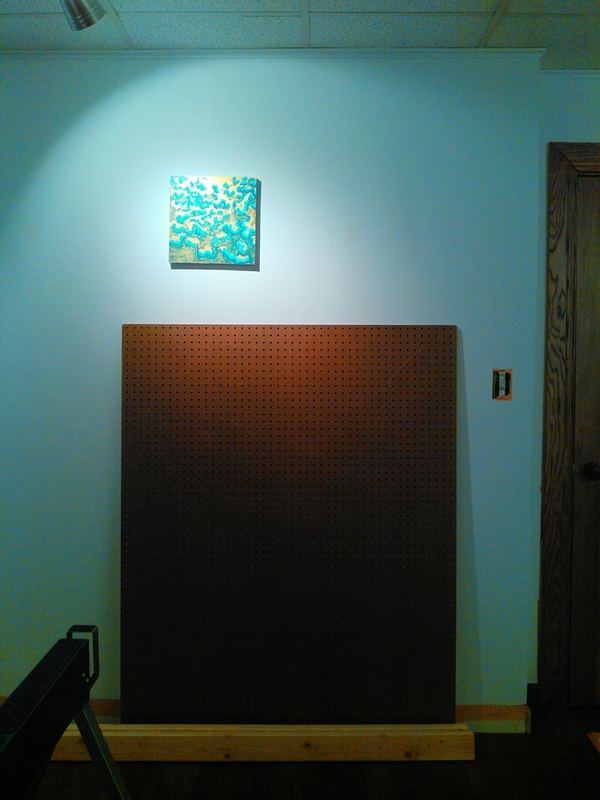 So before I even put a deposit on the space, I knew I wanted to build some kind of moveable display wall, to better highlight my work to the owners and visitors of all the other businesses in the building. It would also afford me a little privacy for my quiet painting moods, without the risk of appearing unwelcoming to potential visitors. I had been thinking about how to start the structure of my wall for a while, then one day spotted these prefab wooden shelf inserts at the local Menard’s store. I thought it was the perfect shortcut and the price was right, so I bought two and screwed them together side-by-side. My next step was to figure out what kind of skin to put on my wall. 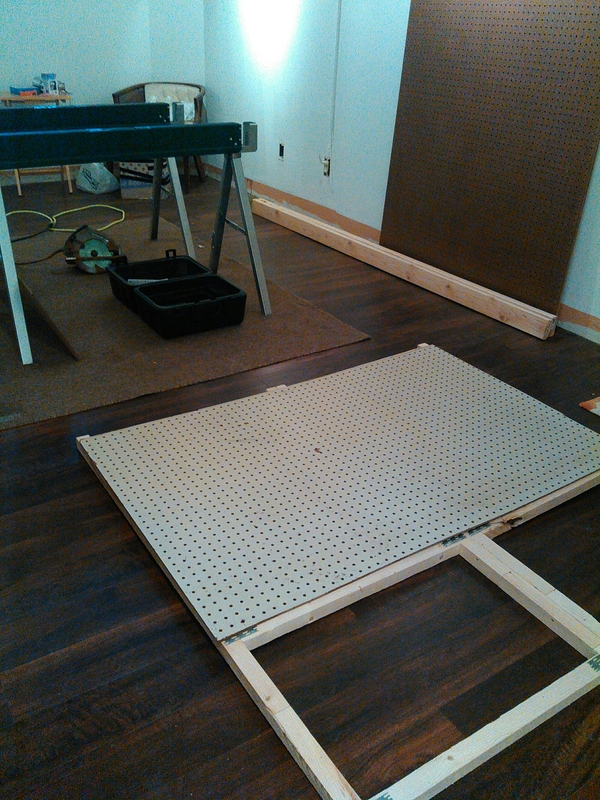 It ended up being a little too wide for my first plan, which was to screw hardboard sheets over the frame. 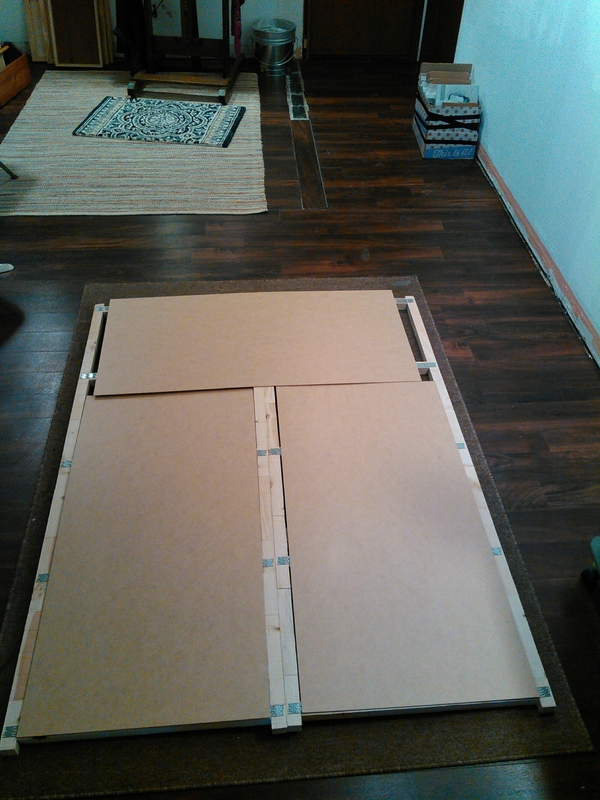 So, I went to the Habitat Re-Store in search of an alternative solution, which turned out to be some nice large sheets of peg board! One of the volunteers was very kind to load it into his truck and follow me back to the studio, seeing as it was an inch or two too wide to fit into my hatchback. 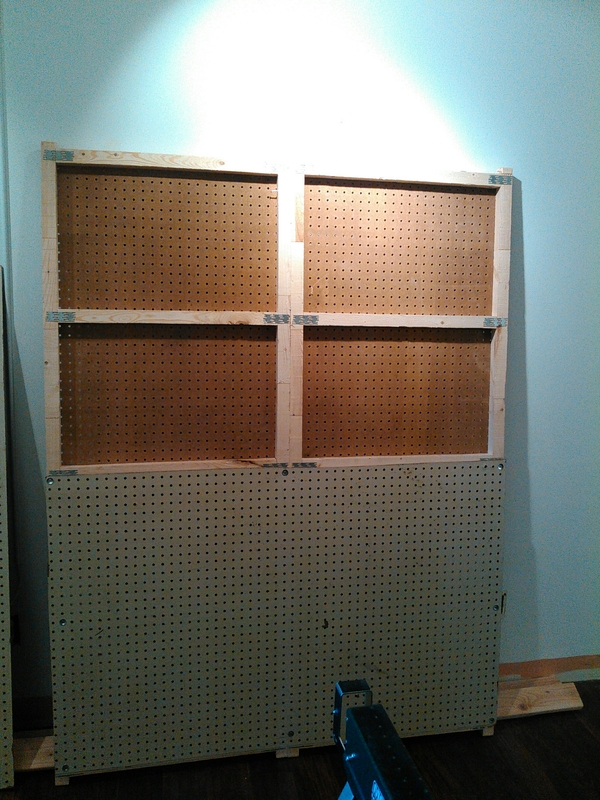 So, some pencil lines and cuts later, I had some nice panels trimmed to size and zipped on with screws and washers. 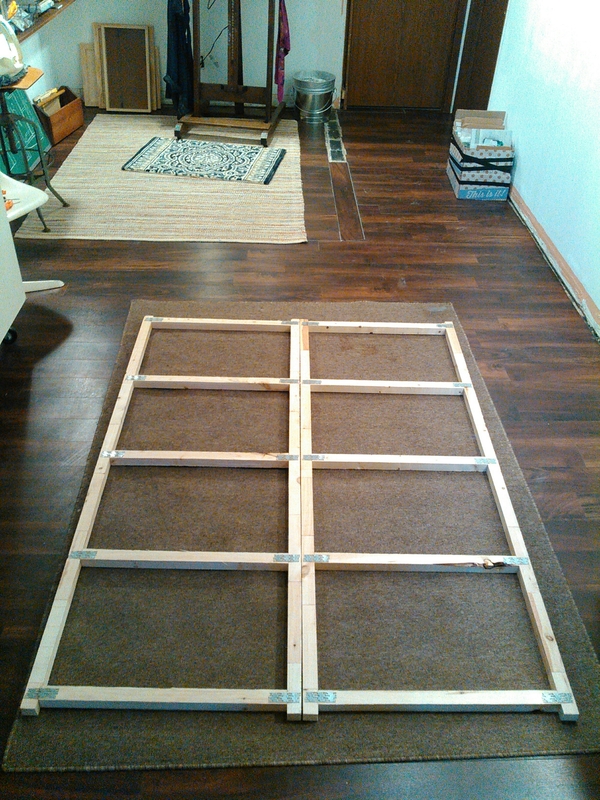 My next step was to make the “feet” of the wall. 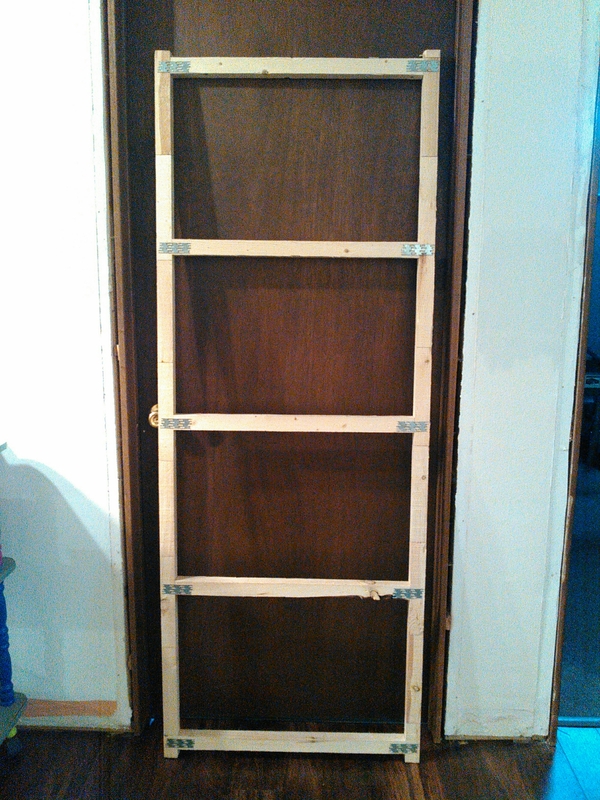 I used 2×4 lumber and mitred the corners for a cleaner more professional look. 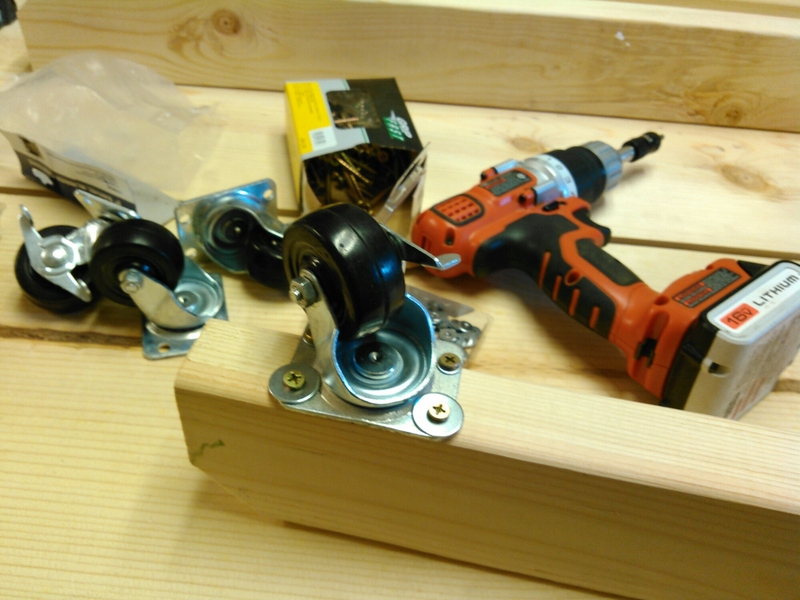 Then I put some castors on them. 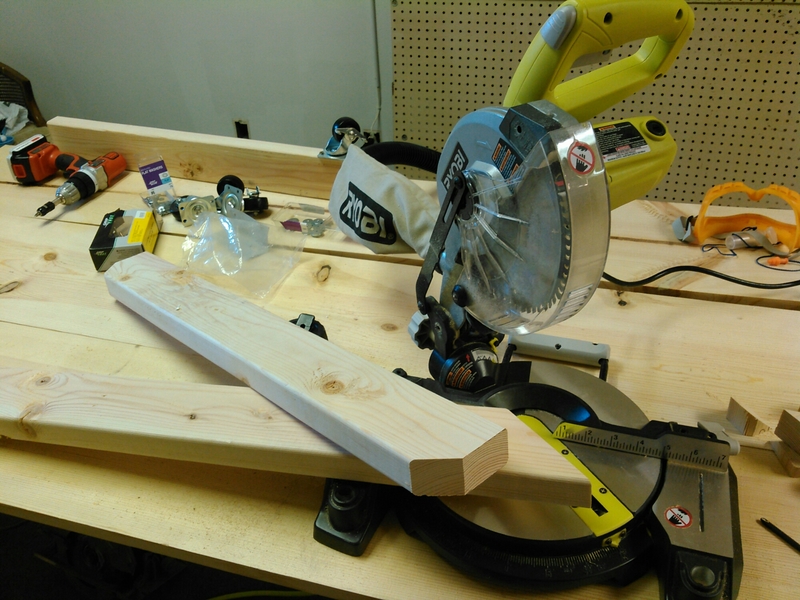 After that, I measured and cut more 2×4 to make the cross-bracing or whatever term actual carpenters would give to such a support technique. 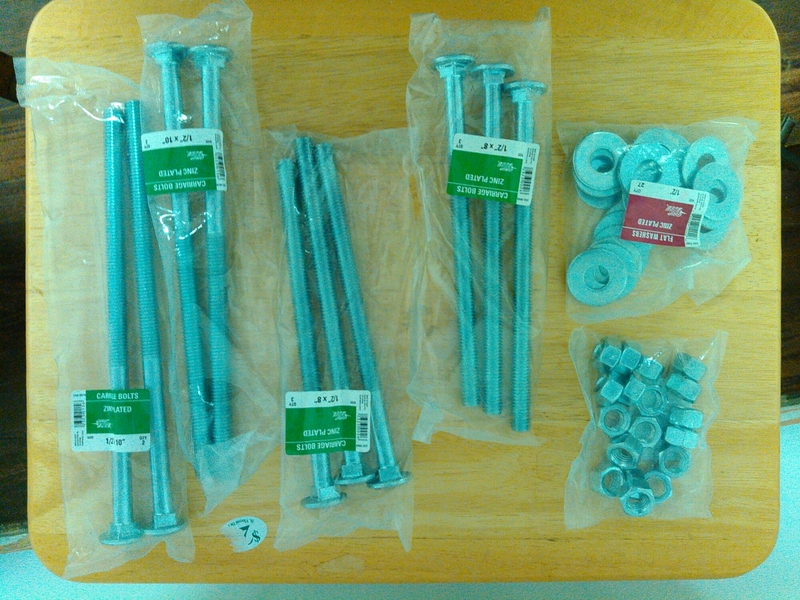 I am at an impasse now until I have time to go to my in-laws’ place and use their drill press, seeing as I chose to use carriage bolts to assemble the base pieces to the wall. 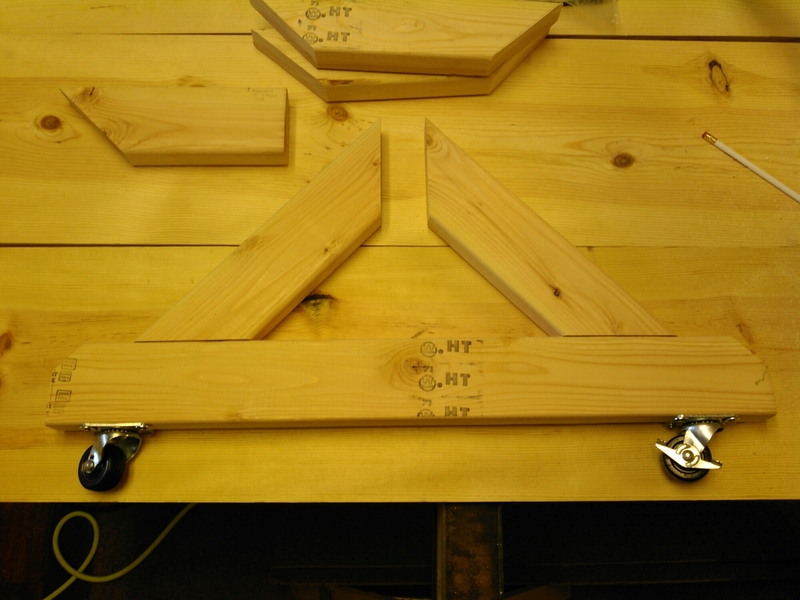 I will have to make sure the angles are just right, and the holes line up perfectly. So, for now, it has it’s first coat of flat white paint and will probably be used as a temporary work surface seeing I have other projects in mind to do before this will be finished.